Beautiful flies. Interesting bit of info about the low water hooks! Someone who know how these things are done should pin the photographs of her flies. Just screenshot them and then post them? Is that legal/possible? I gather, that the "hammer price" was £22,000 or about £700. a fly. Unreal! More money than brains. Much like the Traherne flies, it would be fun to tie the lot and frame them together. You could title the frame "Twenty two thousand pounds". I know that would make me feel really good about myself. And who knows, one day someone might offer to pay twenty two, if not twenty two thousand pounds for it! 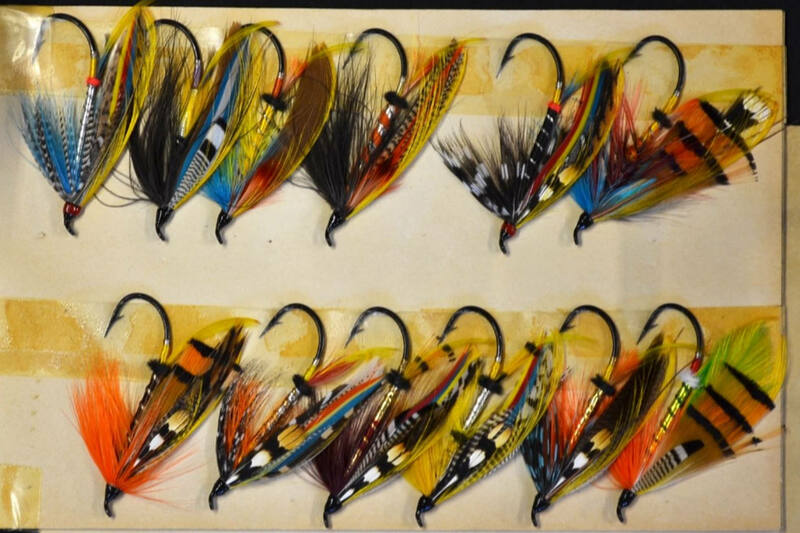 Unique Collection of 47 Megan Boyd Salmon Fishing Flies –all fully dressed, all different and come in the original wrappers with each fly named and written by Megan Boyd together with the original hand written envelope. Each fly is on Partridge 6/0 low water single hook which in her opinion the flies looked better on low-water irons and each measure 55mm overall. A few initial observations: 1) Started all tips well forward of the barb. 2) 50/50 use of split/unsplit Jungle feathers. 3) Didn't mind lumpy tags 4) Used quite long and high set tails. 5) Slim, un-tapered bodies. 6) Generally slim profile with married wings apparently fewer than 24 barbs. 7) Only 37 of the 47 have crest toppings. 8) 20 of the 47 have horns. 9) Tinsels are dead on evenly spaced on every fly. 10) No cotinga and I don't think any crow. Subs. 11) whole tippet end rather than strands for tail veilings. Based on a note I received from her in the late 1970's, she refused to use subs...only the real thing. The couple dozen hairwings of hers I had (gave some to friends) all the crow was real. Looks like kingfisher instead of chatterer though. I seem to remember somewhere reading or hearing that chatterer was actually the sub for kingfisher which was hard to get for a while. Strange but apparently true. ?????? True, George. Golden Pheasant was even more rare. It's hard to tell from the photos. If someone assured me that both crow and cotinga were used, I would have to see the flies in hand to disagree. The "Nighthawk", for instance, does look more like cotinga than kingfisher. The feathers I take to be crow or a sub look more like subs in the images, but that may well not be the case. I do think it fair to say that cotinga and kingfisher are interchangeable rather than being subs, going either way.